Champion, Julie and Nicolas Liucci-Goutnikov. Jeff Koons: La Retrospective: The Portfolio of the Exhibition. France: Centre Pompidou, 2014, p. 125. Champion, Julie and Caroline Edde. Jeff Koons: La Retrospective: The Album of the Exhibition. Belgium: Centre Pompidou, 2014, p. 47. Blissett, Luther. “Les obsessions majeures de Koons.” Beaux Arts editions December 2014, p. 32. Romanacce, Aurélie. “Jeff Koons: Le Roi Midas.” Arts Magazine December 2014, p. 112. Lavrador, Judicaël. “Jeff Koons: génie ou imposteur?” Beaux Arts editions November 2014, p. 136. Bousquet, François. “Art Contemporain la Foire au Milliards.” Le Figaro 29 November 2014, p. 46. Obrist, Hans Ulrich. The Conversation Series 22 : Jeff Koons. Cologne: Verlag der Buchhandlung Walther König, 2012, p. 99, illustrated. Bouvier, Raphaël. Jeff Koons - Der Künstler als Täufer. München, Germany: Wilhelm Fink Verlag, 2012, p. 276 (pl. 56), illustrated. Naumann, Francis M. Jeff Koons - New Paintings. Gagosian Gallery, Base Design, New York, 2010, p. 5, illustrated in color. Dreyfus, Laurence. 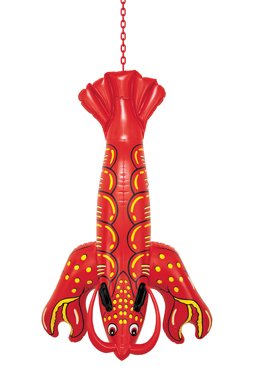 "Jeff Koons, Roi Soleil." l'Officiel September 2008, pp. 331, illustrated in color (installation view, Château de Versailles, Versailles, 2008; The Brant Foundation, Greenwich, 2010) 9, 79 (partial view), 109, 175, inside cover page, illustrated in color. Noce, Vincent. "Coup de Koons a Versailles." Liberation 26 August 2008, p. 28, illustrated in color (installation view, Château de Versailles, Versailles, 2008). "King Koons." Elle [France] 18 August 2008, p. 93, illustrated in color (installation view, Château de Versailles, Versailles, 2008). Gassot, Sylvie. "Jeff Koons: il Fait sa Revolution Pop Chez Louis XIV." 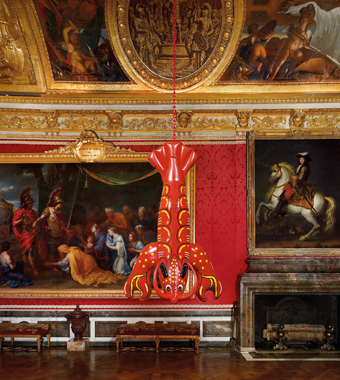 Gala August 2008, p. 78, illustrated in color (installation view, Château de Versailles, Versailles, 2008). Stramberg, Susan. "Jeff Koons Has a Ta-Da Moment in Chicago." NPR Morning Edition 25 July 2008, illustrated. Bourdeaux-Martin, Helianthe. “Profile – Dominique Levy.” Whitewall Winter 2008, p. 42, illustrated in color (installation view, L&M Arts, New York, 2004). Hulk Elvis. Exh. cat., London: Gagosian Gallery, 2007, p. 41 (fig 42), illustrated in color. Holzworth, Hans Werner, ed. Jeff Koons. Cologne, 2007, cover, illustrated in color, pp. 37, 543, illustrated in color. Bonami, Francesco. "Jeff Koons." Panorama First (no. 4) 2008, pp. 112-118. McElheny, Josiah. “Readymade Resistance: On Art and the Forms of Industrial Production.” Artforum October 2007, p. 327, illustrated in color. Seymour, Stephanie. "Jeff Koons: Art Made in Heaven." Whitewall Fall 2007, p. 125, illustrated in color. Utz, Philip. "Catching up with Jeff Koons." Numero (no. 6) [Tokyo] September 2007, pp. 66, illustrated in color. 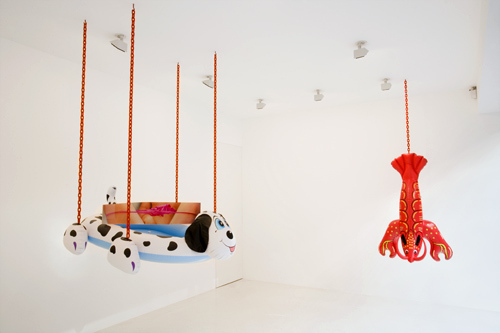 "Jeff Koons: Popeye & Jeff Koons: Hulk Elvis." Art and Living (no. 6) Summer 2007, p. 108, illustrated. Valacchi, Maria Chiara. “Jeff Koons.” Muse World Style [Italy] (no. 7) Spring 2007, pp. 40-51, illustrated. Hur, Tae-Woo. “Jeff Koons: An artist who made banality blue chip.” Asiana May 2007, p. 2. Canarutto, Sarah Cosulich. Jeff Koons (Supercontemporanea series). Milan, 2006, pp. 88-89, illustrated in color. Woltmann, Marit, ed. Jeff Koons Retrospektiv. Exh. cat., Oslo: Astrup Fearnley Museet for Moderne Kunst, 2004, p. 114. Abramovitch, Ingrid. "American Scene: this Month on the Design Beat." House & Garden August 2004, p. 59, illustrated. Yablonsky, Linda. “Jeff Koons.” Art & Auction March 2004, pp. 36–37, illustrated. Jeff Koons: Highlights of 25 Years. Exh. cat., New York: C&M Arts, 2004, pp. 60, 87.